I published the provocatively-titled article, “Bad Data Costs the United States $3 Trillion per Year” in September, 2016 at Harvard Business Review. It is of special importance to those who need prospect/customer/contact data in the course of their work. Consider this figure: $136 billion per year. That’s the research firm IDC’s estimate of the size of the big data market, worldwide, in 2016. This figure should surprise no one with an interest in big data. But here’s another number: $3.1 trillion, IBM’s estimate of the yearly cost of poor quality data, in the US alone, in 2016. While most people who deal in data every day know that bad data is costly, this figure stuns. While the numbers are not really comparable, and there is considerable variation around each, one can only conclude that right now, improving data quality represents the far larger data opportunity. Leaders are well-advised to develop a deeper appreciation for the opportunities improving data quality present and take fuller advantage than they do today. Quite quickly, this business of checking the data and making corrections becomes just another fact of work life. Take a look at the figure below. Department B, in addition to doing its own work, must add steps to accommodate errors created by Department A. It corrects most errors, though some leak through to customers. Thus Department B must also deal with the consequences of those errors that leak through, which may include such issues as angry customers (and bosses! ), packages sent to the wrong address, and requests for lower invoices. Visualizing the extra steps required to correct the costly and time consuming data errors. I call the added steps the “hidden data factory.” Companies, government agencies, and other organizations are rife with hidden data factories. Salespeople waste time dealing with erred prospect data; service delivery people waste time correcting flawed customer orders received from sales. Data scientists spend an inordinate amount of time cleaning data; IT expends enormous effort lining up systems that “don’t talk.” Senior executives hedge their plans because they don’t trust the numbers from finance. 50% — the amount of time that knowledge workers waste in hidden data factories, hunting for data, finding and correcting errors, and searching for confirmatory sources for data they don’t trust. 60% — the estimated fraction of time that data scientists spend cleaning and organizing data, according to CrowdFlower. There is no mystery in reducing the costs of bad data — you have to shine a harsh light on those hidden data factories and reduce them as much as possible. The aforementioned Friday Afternoon Measurement and the rule of ten help shine that harsh light. So too does the realization that hidden data factories represent non-value-added work. To see this, look once more at the process above. If Department A does its work well, then Department B would not need to handle the added steps of finding, correcting, and dealing with the consequences of errors, obviating the need for the hidden factory. No reasonably well-informed external customer would pay more for these steps. Thus, the hidden data factory creates no value. By taking steps to remove these inefficiencies, you can spend more time on the more valuable work they will pay for. Note that very near term, you probably have to continue to do this work. It is simply irresponsible to use bad data or pass it onto a customer. At the same time, all good managers know that, they must minimize such work. It is clear enough that the way to reduce the size of the hidden data factories is to quit making so many errors. In the two-step process above, this means that Department B must reach out to Department A, explain its requirements, cite some example errors, and share measurements. Department A, for its part, must acknowledge that it is the source of added cost to Department B and work diligently to find and eliminate the root causes of error. Those that follow this regimen almost always reduce the costs associated with hidden data factories by two thirds and often by 90% or more. I don’t want to make this sound simpler than it really is. It requires a new way of thinking. Sorting out your requirements as a customer can take some effort, it is not always clear where the data originate, and there is the occasional root cause that is tough to resolve. Still, the vast majority of data quality issues yield. Importantly, the benefits of improving data quality go far beyond reduced costs. It is hard to imagine any sort of future in data when so much is so bad. Thus, improving data quality is a gift that keeps giving — it enables you to take out costs permanently and to more easily pursue other data strategies. For all but a few, there is no better opportunity in data. The article above was originally written for Harvard Business Review and is reprinted with permission. In January 2018, Service Objects spoke with the author, Tom Redman, and he gave us an update on the article above, particularly as it relates to the subject of data quality. The answer is, “Of course they care. A lot. So much that they implement ‘hidden data factories’ to accommodate bad data so they can do their work.” And the article explored such factories in a generic “two-department” scenario. I hope readers see the essential truth this picture conveys and are appalled. 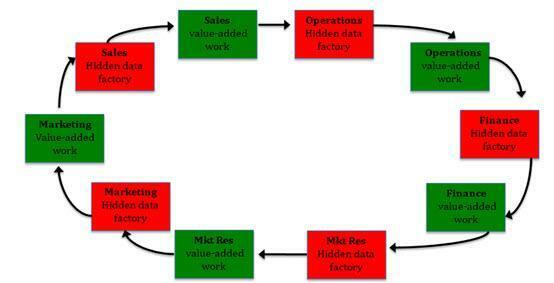 Companies must get in front on data quality and make these hidden data factories go away!